Mankiw's Principles of Economics, the most widely used introductory economics textbook, can be held high as an iconic symbol of what is wrong with the economics profession. ...We are walking out today to join a Boston-wide march protesting the corporatization of higher education as part of the global Occupy movement. Since the biased nature of Economics 10 contributes to and symbolizes the increasing economic inequality in America, we are walking out of your class today both to protest your inadequate discussion of basic economic theory and to lend our support to a movement that is changing American discourse on economic injustice. Professor Mankiw, we ask that you take our concerns and our walk-out seriously. The Mankiw symbol gained more power this week from his recent attempt to defend the 1% in the Journal of Economic Perspectives. The article has been given the treatment it deserves by Unlearning Economics. Add to these facts that Mankiw is a known Republican, acting in advisory positions for Bush and now Romney, who does not disclose these interests in his teaching or mainstream press articles, we get a man who epitomises all that is wrong with the profession. It won't be long before the name Mankiw becomes an verb to describe an argument that uses simplistic reasoning unrelated to the real world situations to advance one's own financial interests. To get down into a little more detail, in what should be an important chapter in Mankiw's textbook on the effects of taxes on markets, he simply rehashes a handful of nonsense myths about taxation - the Laffer curve, the French being taxed into low work hours, land taxes being unable to raise enough revenue for government and so forth. One interesting point is his statement that taxing land values are impractical because the value of land is inseparable from building improvements therefore such taxes will be distortionary. This might seem a minor issue in the much bigger issues covered in the almost 900 page tome, but it concerns the most fundamental issues economists are meant to understand - where value comes from, and how best to raise taxes. Why pick on this minor issue? Because it reveals the detachment of the theories taught to students from reality. In reality most countries do value land without building improvements for tax purposes. It is a very common way to raise revenue and the valuation methodologies are well accepted and defendable in courts of law. In fact this process in intimately linked with compulsory acquisition rules that are the real practical mechanisms for public investment that Mankiw seems to ignore. This type of indoctrination into economics is powerful stuff. Next time an economist argues by appealing to ECON101, you can say "don't bloody mankiw me". It says, the value of land often comes from the improvements, clearing tress, building sewers and roads. This myopic. Sewers and road paid for by others, not the landowners. The roads and sewers are paid for by the community. Their efforts soaks into the land and crystalizes as land values. The landowner did not create the land value. 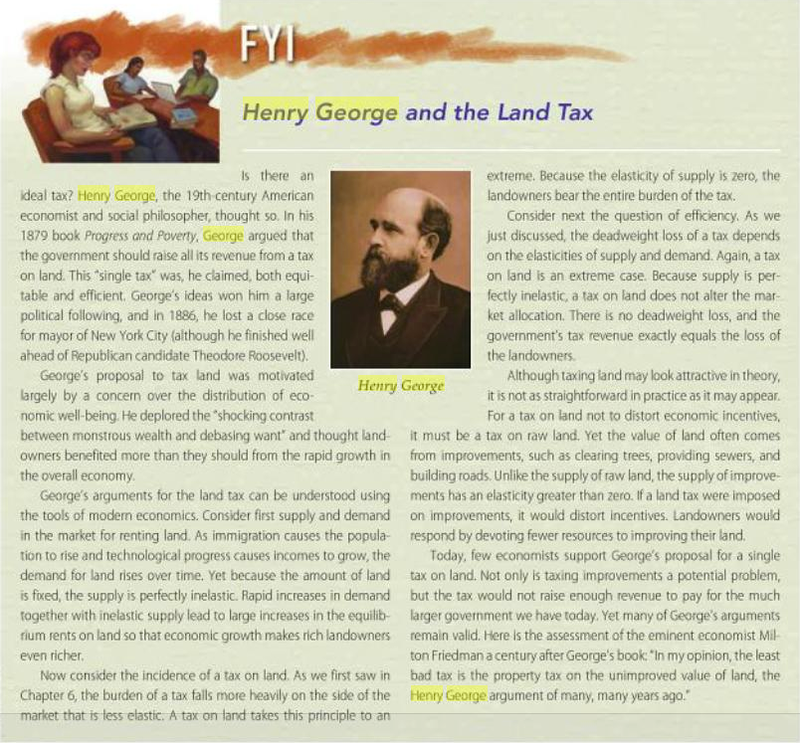 In the current edition, Mankiw and his publisher deleted the Henry George feature. They did a survey of professors using his text, and the HG feature scored low on interest and usage.